It’s the question that drives us, Neo. It’s the question that brought you here. You know the question just as I did. Nirvana is the state of being perfect, being free from greed, anger and ignorance and all defilements of our mind. The person who has attained Nirvana does no action, speech or thought that will harm others or will cause any bad reaction in future in anyway. He has no desires that will cause greed, jealousy and anger to be arisen. Thus he is free from suffering, free from fear, worry and tension. Thus, he does not suffer any worldly pain. It means freedom from cycle of birth and death. There will be no further birth after attaining Nirvana and no further suffering. The person may still have to go through illness, old age and death, which is the consequence of birth in present life. There is no suffering of mind, but only of body as a result of wear and tear of body and limited lifespan of physical body. On attaining nirvana, a person is free from the three root cause of suffering and understands the true nature of all things. Thus there is no further attachment, no further desires that will lead him to further sufferings. Thus, the person attaining Nirvana has perfected himself. Nirvana also means freedom from the cycle of Samsara or cycle of birth & death & suffering. On death, the body is disintegrated into its component parts that of earth, water, fire and air. The mind or consciousness no longer exists as there is no further desires and karma left to form into another life for rebirth. 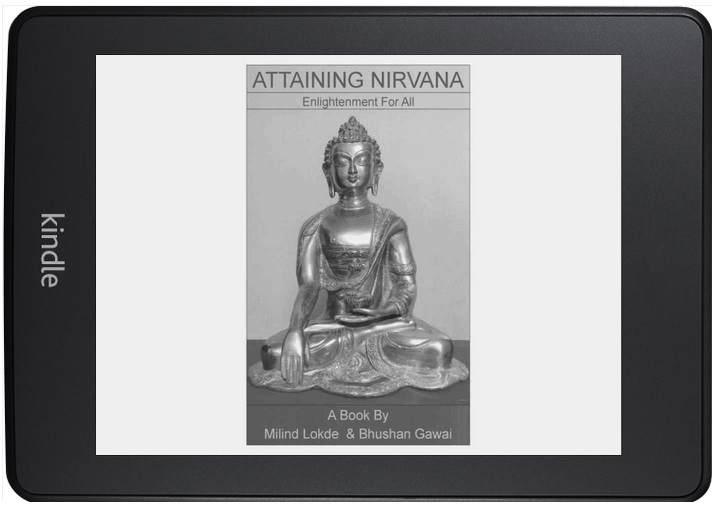 Why do we need to attain Nirvana? Nirvana means freedom from suffering as a human being/living being. But, why do we suffer? We suffer due to our deeds also called karma or action which have bad reaction/effects. So if we are able to reduce our bad deeds/karma/action we will suffer less to that extant. Our actions in turn are the result of our mental defilements. If we are able to completely remove our defilements we will stop suffering altogether. This is basically the aim of Nirvana. But Nirvana is much more than just eradicating our defilements, it is eradicating defilements through wisdom, through knowledge and understanding. How do we attain Nirvana? To attain Nirvana we need to follow the Noble Eight Fold path. In this book simple and easy to follow steps cover the Eight Fold path which can be followed by anyone. Though the steps are simple, they need to be followed by each person for himself, which in turns needs willingness and persistence. Buddha after attaining Nirvana or Enlightenment (found the path to eradicate sufferings), taught the path to his disciples and all people so that they can too, like him eradicate their suffering and attain Nirvana. Many people at his time and after him attained Nirvana following the path or teachings. Buddha’s teachings or the path is referred as the Dhamma. Those who have benefited from practicing Buddha’s teachings are referred as the Sangha. All those who attained Nirvana after Buddha following his teachings are referred as Arahats. Those who avoid attaining Nirvana even though they can attain it, so that all people can benefit from their teachings and knowledge are referred as Bodhisattva.